Sunny, sheltered site or greenhouse. Nasturtium, Dill, Radish, Marigold, Oregano, Sunflower, Borage, Lettuce, Turnip and Tansy. Sow under cover in pots or direct when soil has warmed. Plant out after last frosts. Support plants well so they can climb upwards, even when the cucumbers get large. This also protects the cucumbers from slugs. Occasionally a plant can produce very bitter cucumbers so always test a bit before serving to others! 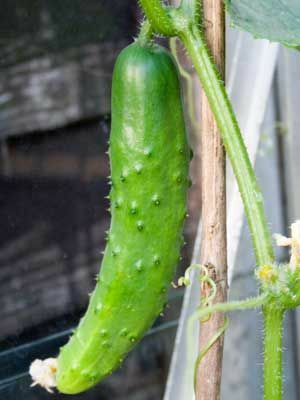 Cut the cucumbers off the plant when they are still quite young, otherwise the skin becomes hard and will need peeling. More cucumbers will then be produced.